Target 2 DARK monsters with 0 DEF in your GY; add those targets to your hand. 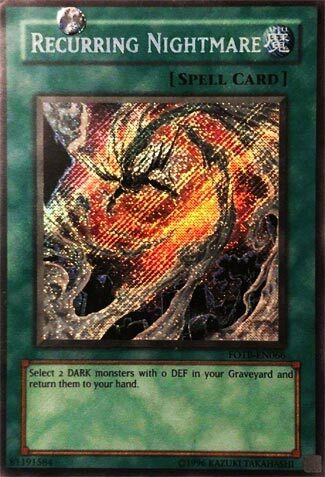 Throwback Thursday this week goes back to a card that was in the original Dark Structure Deck that was only released in the OCG, but TCG got as a Secret Rare in Force of the Breaker, Recurring Nightmare. Recurring Nightmare is a simple Normal Spell that lets you add 2 Dark monsters with 0 DEF back from the GY to the hand. Nothing much here, really. There are two new Dark monsters with 0 DEF in the Structure Deck and both are very good as once can search Lair of Darkness and the other can get you to Traps, both of which go to the GY to do said things unless you tribute another monster for Traps. I can’t think of other great Dark monsters with 0 DEF but this card is worth playing if you run several Darks with 0 DEF. Art: 4/5 Maybe the Secret Rare I am looking at isn’t doing this the justice though. Trying to imagine it without it. Probably would look amazing in Ultimate Rare. Recurring Nightmare is a simple enough Magic card, and appropriate too, given the theme of the week. This is a +1 for you, you get to add two Dark Monsters from your Graveyard to your Hand, so long as they have 0 defense. Off the top of my head, there’s a handful of Blackwings I recall that fit this criteria, and I assume too (again just thinking) that probably Zombies are going to fit this category the most. This one is a bit harder and more situational to use then the rest of the cards we look at this week, but if you run enough to warrant it, go ahead.